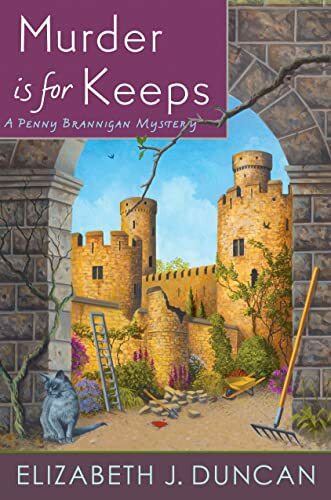 Murder is for Keeps, the latest book in an award-winning mystery series, celebrated for its small-town charm and picturesque Welsh setting, starring amateur sleuth Penny Brannigan. Local artist Penny Brannigan has been spending her summer painting Gwrych Castle and its surrounding landscapes. A privately owned, castellated Welsh country house, Gwrych has been sadly neglected for decades and is in a heartbreaking state of disrepair. So when she learns architectural historian Mark Baker is leading a team of enthusiastic volunteers to restore the castle grounds and gardens to their former grandeur, Penny is thrilled. But it’s not long before disagreements over the restoration turn deadly, and Penny is horrified to discover the body of a volunteer hidden in a castle outbuilding. Penny enlists her friend Gareth Davies, recently retired from the North Wales Police Service, to help investigate. As the two dig deeper into the castle's history, including its glamorous heyday in the 1920s, they find startling connections between an old, unsolved murder and Gareth's own family, and as they solve the present-day murder, Penny recovers a stunning piece of the castle's architectural heritage.